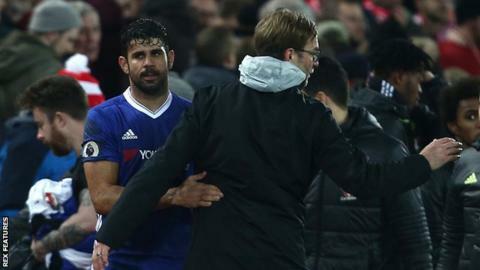 Liverpool manager Jurgen Klopp says he could never be friends with Diego Costa and that the Chelsea striker is "not the nicest guy" on the pitch. Costa won a penalty, for a foul by Joel Matip, that was saved by Simon Mignolet as the Blues were held to a 1-1 Premier League draw at Anfield. "What [Blues boss] Antonio Conte is doing is outstanding - but Chelsea without Costa this season?" said Klopp. Despite the draw, Chelsea extended their lead at the top to nine points. Klopp added: "If I had played against Costa I could never be friends, that's how it is, but when you have him in your team it's much more fun. He is a warrior." Liverpool produced a much-improved performance as they ended a run of three successive defeats with a hard-earned point against the leaders. David Luiz put the visitors ahead with a free-kick which embarrassed Mignolet, before the Liverpool keeper saved Costa's penalty after Georginio Wijnaldum equalised with a header. "When you have a good chance with a penalty in the 76th minute then you think you could win and take three points but Mignolet made a great save," said Chelsea boss Conte. "We had two chances to score the second goal but it didn't happen but we must be pleased. It wasn't easy to play with the same intensity of Liverpool so we must be pleased." Chelsea may not have left Liverpool with a victory - but they pulled away from Anfield on their way back to London with an important point and their position at the top of the Premier League strengthened. Antonio Conte's side showed the touch of champions to draw 1-1 at Liverpool - they might even have won had Costa scored a late penalty - even though they were nowhere near their best. Liverpool pressurised and pushed them with a style that was high on intensity but short on guile and quality, but Chelsea never panicked and were still pushing for a win late on, as indeed were Jurgen Klopp's side. And once Conte returned to the dressing room, he discovered that results elsewhere had made Chelsea the big winners of the night as they extended their lead at the top to nine points. The Blues had, of course, kept themselves 10 points ahead of Liverpool with this result but added bonuses came in the shape of Tottenham's failure to win at Sunderland and Arsenal's abject display that saw them lose at home to Watford. Conte was already celebrating even before he learned of those results, so this was treated like a point gained rather than two lost. And there is something about the inner steel of this Chelsea side, allied to the quality they possess, that gives them the real look of champions. Former Liverpool midfielder Danny Murphy, speaking on Match of the Day: "In the second half Liverpool's bravery and courage was brilliant. Against probably the best counter-attacking side in the country they could have got done. But they committed many men forward - a huge risk, but one they had to take. "It was a really, really courageous performance from a side that had only won one of the previous eight games. Jurgen Klopp deserves credit, as do the players who came out under huge pressure and deserved the draw." Former England winger Trevor Sinclair, speaking on Match of the Day about David Luiz's goal: "It was an unusual free-kick by David Luiz but the technique is absolutely brilliant. It has pace and dip. A super finish. If there were two goalies in there I'm still not sure they would have stopped it."